The group is also working with Colorado Republicans on several other legal and legislative efforts to legalize anti-gay discrimination. ADF is drafting and pushing legislation with GOP sponsorship and representing a Republican campaign vendor in a lesser-known lawsuit against Colorado’s civil rights laws. 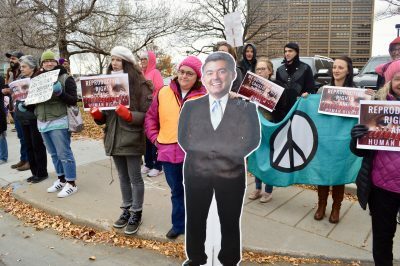 Designated a hate group by the Southern Poverty Law Center in 2016, ADF is involved with two discriminatory bills introduced in the Colorado legislature this session. It provided language for the bills and its “Allied Attorneys” testified on their behalf, with out-of-state legal staff flying across the country to speak on one of them. ADF’s authorship of the Mississippi law was widely reported. During the legal challenge, Campaign For Southern Equality filed an affidavit stating unequivocally that ADF wrote the bill. ADF’s involvement in the testimony for this bill was extensive. Staff attorney Matt Sharp was the first expert witness to testify for HB18-1206. He flew out from his office in Atlanta to “help with testimony” according to bill sponsor state Rep. Steve Humphrey (R-Severance) who thanked him on Facebook for his efforts. 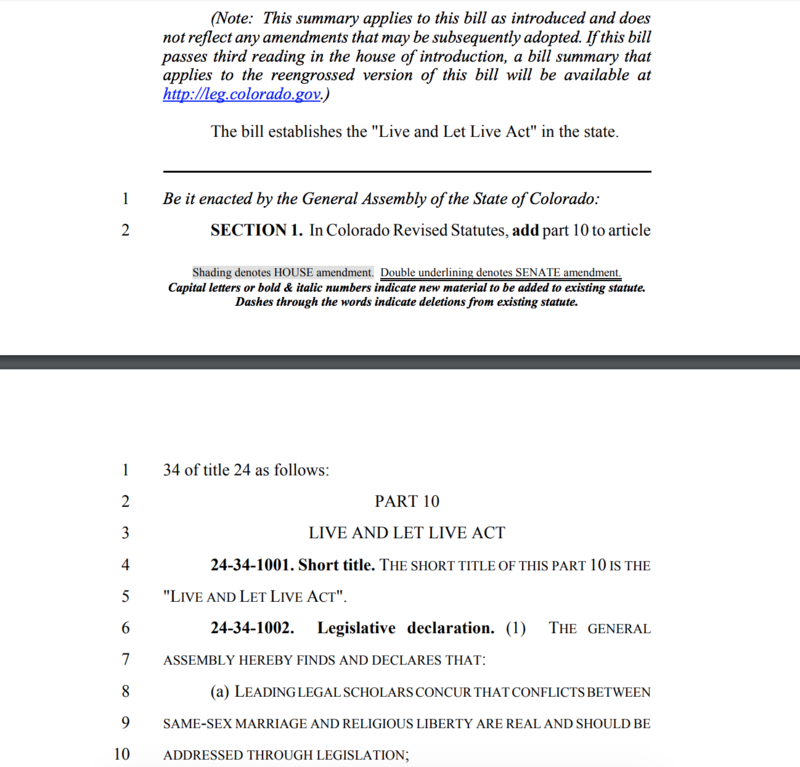 At least three other ADF-affiliated witnesses also spoke in favor of the bill’s passage: Autumn Leva of the Family Policy Alliance (FPA), Jenna Ellis of Colorado Family Action (CFA), and Kristi Burton Brown. Both FPA and CFA are affiliated with ADF. Jenna Ellis is an ADF “Allied Attorney” who is also a conservative radio personality who made news in 2016 when she apologized for controversial comments regarding her students at Colorado Christian University, where she is an Assistant Professor. Kristi Burton Brown, another ADF “Allied Attorney,” is the registered agent for Values First Colorado, an independent 527 committee responsible for supporting Republican and opposing democratic candidates for the Colorado House. She also is the campaign coordinator for Colorado State Rep. Justin Everett (R-Littleton) in his attempt to replace Walker Stapleton as State Treasurer. 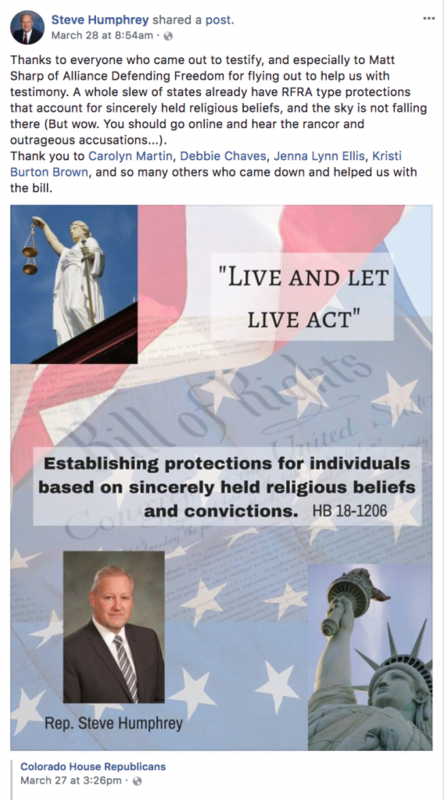 The other anti-LGBT bill backed by ADF was debated in the Senate State Affairs committee on Monday, passing on a party-line vote. 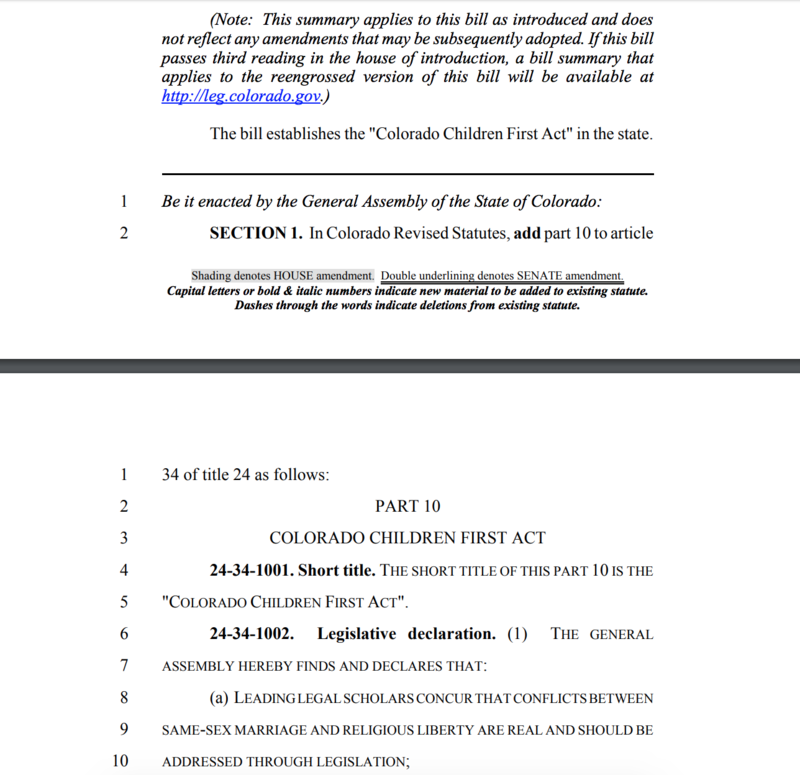 SB18-241, titled the “Children First” bill, is a narrower version of HB18-1206, using similar language but focused only on adoption and foster care agencies. In fact, apart from the title, the first dozen lines of the bill are identical to the already dead “Live and Let Live” bill. It would permit those entities to refuse to place children with LGBT parents. Jenna Ellis also testified in favor of this bill, which now heads to the Senate Appropriations committee. Beyond the dome, ADF attorneys are also representing a Littleton-based web designer, Lorie Smith, who claims she would like to offer wedding website-building services but can’t because she would refuse to serve LGBT couples, in violation of Colorado state law. The lawsuit is a pre-emptive challenge and one of several ADF has filed across the country. All the complaints have the same essential premise: a business owner who sells or wants to sell wedding-related products or services in a city with laws that protect LGBT people from discrimination sues the city claiming that those laws infringe on their religious right to refuse customers based on their sexual orientation or gender identity. The 303 Creative lawsuit was partially thrown out by the court last year. The remaining claims are on hold pending a ruling by the United State Supreme Court on ADF’s other Colorado case, Masterpiece Cakeshop v. Colorado Civil Rights Commission. ADF Allied Attorney Michael Francisco, a former Colorado Assistant Solicitor General under Republican Attorney General John Suthers is serving as local counsel. He is teamed with five ADF staff attorneys based in Arizona and Georgia. In addition to being the plaintiff in ADF’s lawsuit against Colorado, Lorie Smith is a vendor for local Republican candidates. 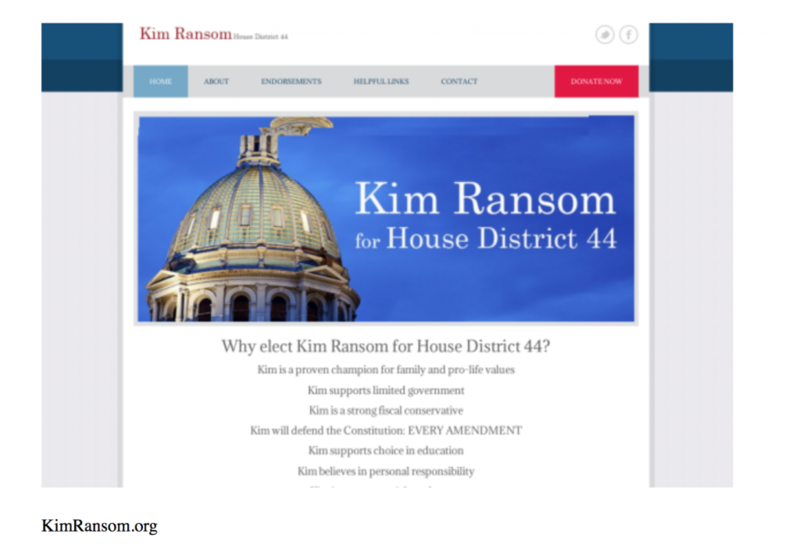 She has built campaign websites for at least three state representatives: Assistant House Minority Leader Cole Wist (R-Centennial) Kevin Van Winkle (R-Highlands Ranch) and Kim Ransom (R-Lone Tree). Van Winkle and Ransom were both co-sponsors of this year’s HB18-1206. Wist and Ransom co-sponsored a bill from last year with very similar language, HB 17-1013. This topic contains 0 replies, has 1 voice, and was last updated by Erik Maulbetsch 11 months, 4 weeks ago.